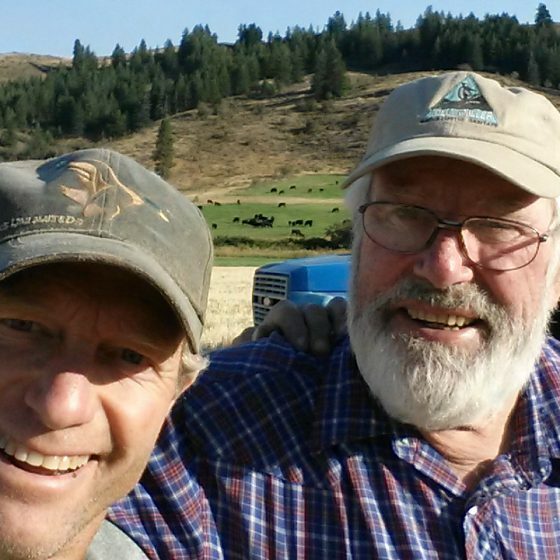 Jolly Miller and I figuring out how to “take a selfie” the last day of harvest. Sandhill cranes sanctified the autumn equinox, making their punctual southbound journey way up in our September sky just a couple days before the “official” calendar date. Each September, I anticipate their lofty chatter. Sure enough this year we heard them, and then looked way up to see 100’s scarcely below the puffy afternoon clouds: at times resting by catching the thermals and riding round and round, before continuing on. Epic. Ancient. Humbling. Besides the changing colors of the Oregon grape, the aspen trees, and the serviceberry one other mark of autumn is Harvest! 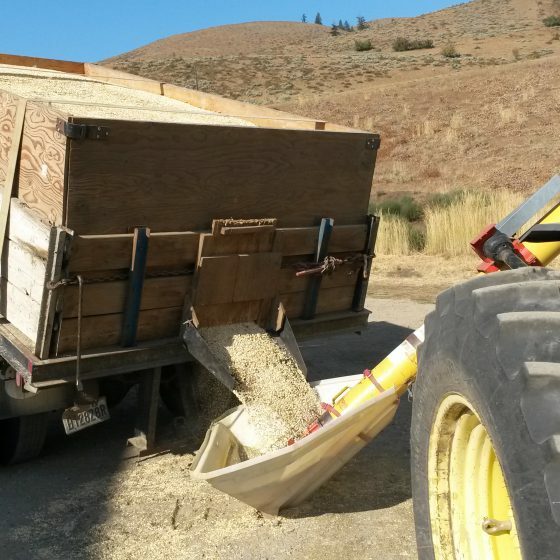 This year’s harvest will go on record as the earliest in the history of Bluebird. Amidst the sometimes dungeon of smoke here, and finally a couple clearer days in the end, we finished harvest on August 31st! Never have we finished cutting before September. Some years we’ve barely gotten started by then. Alas, the grains were ripe and the equipment held up with nominal repairs required and our trusty truck driver Jolly and I went to it. What’s more, it was a decent crop with an over-all average yield and good quality with a second year now of absolutely no weather damage. I’m not saying I like these smoky, dry summers but it does seem to make for good harvesting. Each year I know less about what actually makes a good crop. So many factors play into it surely has to be a combination of things. What I’ve determined is one has to set a plan, try and keep to that schedule, and be ready to change everything. And certainly, it makes little sense to try and anticipate any particular results. Simple! I believe some of the quality of this year’s crop is attributed to our fertility program, yet we had a cool summer as well. The only real heat came the last 10 days in July and early August and then when the smoke settled in, the smoke actually kept the temps. well below average for August. Our emmer and einkorn are so close to being wild grasses; grasses like it cooler so… maybe the grains thrived due to this? That is one of this year’s theories. I’m not sure we’ve had as busy of a later August and September at the granary. Lots of bulk and retail orders weekly and we literally were hauling some loads of emmer straight into our cleaning line to process orders. Field to Table? This grain is about as fresh as grain gets I suppose, and our emmer is cleaning very well again this year. Very pleasing. Kent and Jorge are doing a fine job cleaning and milling up all the orders, including keeping the gals (Tiffany and Sheah) fully stocked for a glut of retail orders from all over. Thank You! Tom Stahl our wheat growing up in Waterville has cut our hard red spring wheat and reports the protein tests to show over 14 %. This is a premium reading. Now he is into our hard white spring and he feels since it is seeded on similar ground, results should also be good. Go, Tom! September has been cool and finally, the smoke has cleared out for good and this comes as a luxurious reprieve for all of us here. We’ve still not had more than a rain shower since May but the irrigation supply held up due to the big recharge last winter. I was able to use our pivots to apply digester to our grain straw – a combination of humates and microbes – and here at the month’s end I’m busy using our no-till drill to sow Austrian winter peas on a couple fields that are due to be rotated out and given a year’s rest form grain. In October we’ll begin fall tillage, primarily working down the grain stubble now that the digester has had a chance to begin “chewing” on the stalks for a few weeks. 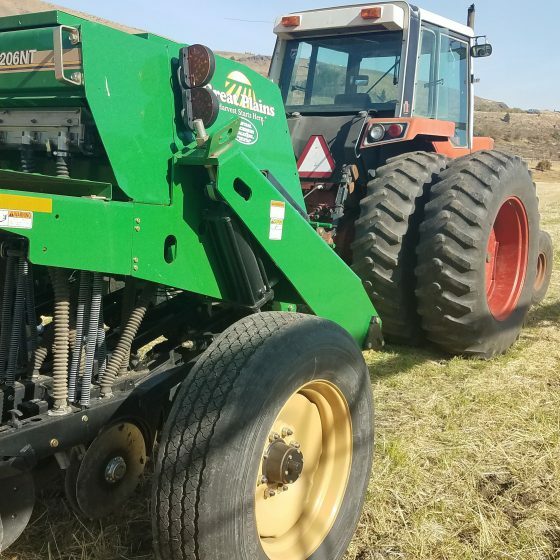 This helps turn the straw into more soil, ultimately, and by kick-starting the decomposing with microbes, less nitrogen is needed to break down the biomass. Which, with both the emmer and particularly the einkorn, we have a lot of! As I mention most every year, fall is my favorite as the shadows lengthen along the hillsides, birds gather, fat clouds seem to stall overhead and the whole of the earth comes close to stillness. September is perhaps the mellowest month of all, with October a coming treat unto itself. Please remember the ritual of school this time of year, as well. And all the little ones are on the streets, and darting around so… be mindful driving. And enjoy this beautiful season! 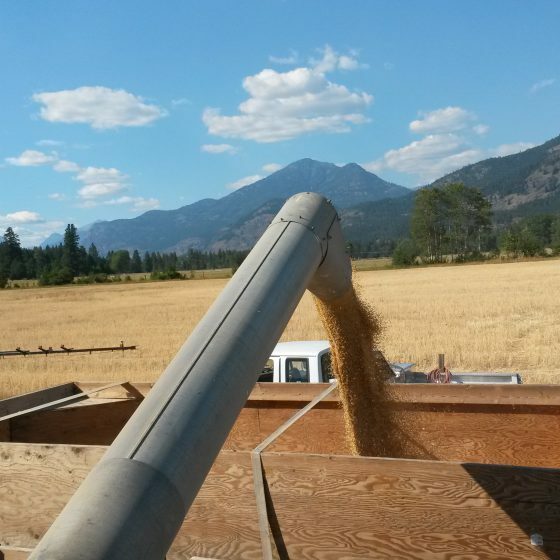 Methow Hard Red Wheat filling up the grain truck to be transported to Bluebird silos. The last of the Emmer harvest going into the silos for winter storage. Planting Austrian winter pea cover crop in Big Valley fields.